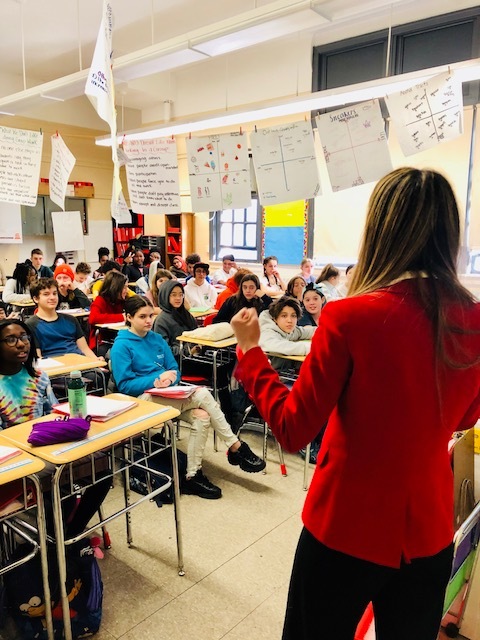 On January, Friday 11, UN SDSN Senior Policy Analyst Teresa Parejo and SDSN Youth UN Focal Point and Arts Twenty Thirty Project Lead Isabel Pérez Dobarro spoke about the Sustainable Development Goals, SDSN Youth and its initiatives (putting particular emphasis on the Global Schools Program), to two classes of middle school students at MS8 Middle School. MS8, also known as The Robert Fulton School: The Magnet School for Exploration, Research, and Design, opened in 1846 in NYC´s neighborhood Brooklyn. Since its foundation, the school has expanded notably, and in the year 2014 it became a full K to 8 school. As part of the Global School´s aim to include the sustainability curriculum in primary and secondary schools worldwide, members of the SDSN and SDSN Youth teams have joined forces to raise awareness about the Sustainable Development Goals (SDGs) in class. Why? To meet the Sustainable Development Goals, we need to generate interest in them in the younger generations, which will be young adults by 2030. 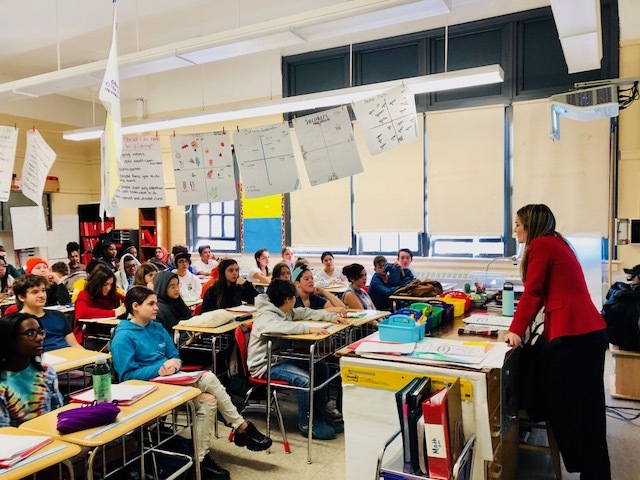 By integrating the Sustainable Development Goals into their daily school schedule, middle schoolers had the excellent opportunity to learn about how to incorporate the goals in their lifestyles and behaviors and reflected on their importance and urgency. The sessions started with a presentation of the Sustainable Development Goals. The students reflected on which of the goals seemed more critical for them and why. Some of them shared experiences from their communities. After, they were asked about the urgency of the goals. The students were able to understand the pressing challenges that we, as a global society face, and see specific examples in which those issues might lead to irremediable consequences. Later, they reflected on the role of youth in the implementation of the Sustainable Development Goals. They analyzed positive examples such as Malala Yousef or Xiuhtezcatl Martinez, who, at their early ages, were already promoting a positive change and fighting for a better future. They also explored the benefits of collaboration across sectors and reflected on how important was the partnerships for the goals. Finally, the presenters showed them SDSN Youth´s opportunities, the SDG index, and the SDG zone, so they could have valuable resources to work on the SDGs at the individual, school or community levels. At the end of the session, many of them were asking questions concerning the different resources and data, and one of the girls even proposed a plan for developing a solar energy system in a nearby building. Through the presentation, audiovisual content, and active participation, Teresa and Isabel provided a framework for the students to put their ideas in practice and gave them valuable information and resources to expand their knowledge on the 2030 Agenda. The students´ interest and engagement proved how relevant and necessary these activities are to educate and inspire the next generation of young leaders. Isabel Pérez Dobarro is the Project Leader of the SDSN Youth´s Project Arts Twenty Thirty, which uses the arts as a tool to raise awareness about the Sustainable Development Goals and the 2030 Agenda. Through this initiative, Pérez Dobarro has organized artistic events all around the world and created a network of international artists committed to SDG implementation. Pérez Dobarro has represented SDSN-Youth at the Winter Youth Assembly, the High-Level Signing Ceremony of the Paris Agreement at the United Nations Headquarters, among other events. In addition to her involvement in SDSN-Youth, Pérez Dobarro is the Western European Representative of the Fair Air Coalition organization. Pérez Dobarro is a Ph.D. candidate at New York University, holds a J.D in Law, and is currently taking law courses at New York University. In addition to her law and sustainability studies, Pérez Dobarro is a concert pianist who has played at Carnegie Hall, Tchaikovsky Conservatory Moscow, and Ateneo de Madrid, and is a prizewinner of competitions in Spain, Portugal, and the United States.